* Department of Embryology and Histology, Gorgan University of Medical Sciences, Gorgan, Iran. ** Assistant professor, Department of Anatomy, Gorgan University of Medical Sciences, Gorgan, Iran. *** Department of Health, Gorgan University of Medical Sciences, Gorgan, Iran. **** Professor, Department of Anatomical Sciences (Embryology and Histology), Gorgan University of Medical Sciences, Gorgan, Iran. SUMMARY: The pyramidal cell density of CA1 hippocampal subfield following STZ-induced diabetes in young rats were studied. 12 male albino 6-week Wistar rats were allocated equally in groups of normal and diabetic. Hyperglycemia induced by Streptozotocin (80 mg/kg) in animals of diabetic group. After 5 weeks of study, all the rats were sacrificed and coronal sections were taken from dorsal hippocampal formation of the right cerebral hemispheres and stained with crysel violet. The area densities of the CA1 pyramidal cells were measured and compared among two groups. No significant difference between the densities of two experimental groups was found. The results can arise from the short period of diabetes and also the possible regenerative processes in developing brain of the young diabetic rats which compensated significant diabetes-induced neuronal loss. KEY WORDS: Pyramidal cell density; CA1; Hippocampus; Diabetes; Rat. RESUMEN: La densidad de las células piramidales del subcampo CA1 hipocampal resultantes de diabetes inducida por STZ en ratas jóvenes fue estudiada. 12 ratas albinas Wistar macho, de 6 semanas fueron asignadas equitativamente en grupos normal y diabético. La hiperglicemia fue inducida por Streptozotocin (80 mg/kg) en los animales del grupo de diabéticos. Después de 5 semanas de estudio, todas las ratas se sacrificaron y se tomaron secciones coronales de la formación del hipocampo dorsal de los hemisferios cerebrales derecho y se tiñeron con violeta crisol. Las áreas de densidad de las células piramidales CA1 fueron medidas y comparadas entre los dos grupos. No se encontraron diferencias significativas entre las densidades de los dos grupos experimentales. Los resultados pueden explicarse debido al corto periodo de diabetes y también por la posibilidad de procesos regenerativos del cerebro en desarrollo de las ratas jóvenes diabéticas los cuales compensan significativamente la pérdida neuronal en la diabetes inducida. PALABRAS CLAVE: Densidad de células piramidales; CA1; Hipocampo; Diabetes; Rata. It has been shown that diabetes predisposes the patient for neuropsychiatric deficits as stroke, cerebrovascular diseases, diabetic encephalopathy, depression and anxiety (Kuhad & Chopra, 2007). Diabetic encephalopathy, characterized by impaired cognitive functions and neurochemical and structural abnormalities, involves direct neuronal damage caused by intracellular glucose (Kuhad & Chopra). Primary diabetic encephalopathy may cause by hyperglycemia and impaired insulin action diabetes. In contrast, secondary diabetic encephalopathy appears to arise from hypoxic­ischemic insults due to underlying microvascular disease or as a consequence of hypoglycemia (Sima et al., 2004). The hippocampal formation plays an important role in spatial navigation and the formation of certain types of memories (Sneider et al., 2006). Subregional models of hippocampal function suggest that CA1 function is critical in correctly identifying novel relationships among objects within a particular spatial context. Furthermore, it is proposed that CA1 is not necessary for short-term (<5min), but is specifically invested in intermediate-term (5min to 24h) maintenance and retrieval of the familiar spatial context (Vago & Kesner, 2008). The impairment of CA1 hippocampal subfield has been reported by previous studies. Biessels et al. who demonstrated either a lack of inducible long-term potentiation of CA1 or a decreased slope of excitory postsynaptic potentials from the same field, suggested both pre- and postsynaptic impairments of CA1 (Biessels et al.,1996). The morphologic changes of CA1 following type 1 diabetes have shown some discrepancies. Some data suggested an apoptosis-induced neuronal loss in type 1 diabetes (Li et al., 2002). The findings indicate that neuronal apoptosis occurs only after a prolonged duration of diabetes and that it may be duration-related (Li et al.). In contrast, it has been shown that a short period of type 1 diabetes can be associated with an increase in small neurons in CA1 hippocampal subfield of the young rats (Malone et al., 2006). Given these different findings, this study was conducted to study the pyramidal cell density of CA1 hippocampal subfield following a 5-week STZ-induced diabetes in young diabetic rats. The study was performed in 2006-7 in the Faculty of Medicine, Gorgan University of Medical Science. Approval for this study was gained from the Animal Care and Ethics Committee of the Gorgan University of Medical Sciences. Control: No injection in first day; Saline daily between 2nd ­ 5th weeks. Diabetic: STZ injection in first day; Saline daily between 2nd ­ 5th weeks. To produce a hyperglycemic model at the first day of experiment, the diabetes was induced with a single IP injection of Streptozotocin (STZ) (80 mg/kg) to overnight fast rats. The STZ dose was determined by a prior pilot study. Streptozotocin (STZ) purchased from Sigma Co. was dissolved in saline and Intraperiteonally injected. Blood glucose sampling. Blood samples for glucose measurements were taken from the tail vein of the rats. The Blood glucose concentration was measured at beginning, 1st, 3nd and 5th wks using an ACCU-CHEK® Active Glucometer, Roche Diagnostics GmbH, Germany. Glucose Tolerance Test. 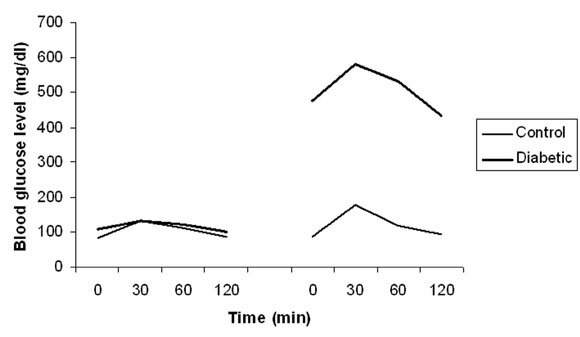 Intraperitoneal glucose tolerance test (GTT) was performed on 16 h fasted rats using 2g Dextrose /kg body weight at the beginning of the experiments. In all groups, blood was collected from the animals by tail snipping at 0, 30, 60 and 120 minutes after glucose load. Also the GTT were performed at 5th wk. Tissue processing. The animals of two groups are sacrificed following ether anesthesia. The skulls of the rats were dissected and the brains were collected. After measurement of the total brain weights i.e hemispheres and cerebellum, the right hemispheres were separated through corpus callosum. The hemispheres were fixed in formaldehyde 10% for 48 hours and paraffin embedded. The 7 µm coronal sections were serially collected from Bregma -3.30 mm to -6.04 mm of hippocampal formation (Paxinos & Watson, 1998). An interval of 20 µm was placed between each two consecutive sections. The sections were stained with crysel violet in accordance with routine laboratory procedures. Morphometric study. The picture of each section was taken by an Olympus BX 51 microscope and DP 12 digital camera under magnification of 400x. An area of 62500 µm2 was selected in the same region of CA1 hippocampal subfield in all sections. To measure the area density of CA1 pyramidal cells, the pictures were transferred to the computer. Using OLYSIA Autobioreport software, Olympus Co, the appropriate grids were superimposed on the pictures and the cells were counted manually. Toperform an unbiased measurement, the individual was double-blinded and only the cells with significant characteristics of pyramidal cells were counted. Statistical analysis. Data was analyzed using SPSS by one-way analysis of variance (ANOVA) followed by LSD post-hoc test, and results are expressed as the mean ± standard deviation (SD). Differences were considered significant for p<0.05. The Glucose Tolerance Test (GTT) of the two experiment groups at the beginning and the 5th wk of the study were shown in Fig. 1. As shown in the figure, the GTT results of all rats were normal at the beginning of experiment. The GTT results at the end of study showed prominent difference with the prior results in the rats received STZ. As shown in Fig.1, the control rats which have not received STZ showed a normal GTT. 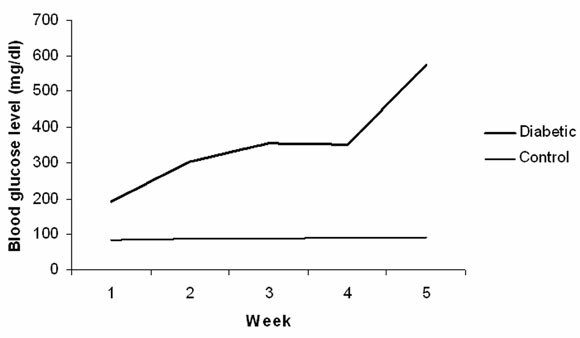 The blood glucose levels of the two experimental groups during different weeks of the study were shown in the Fig. 2. Fig.1. Glucose Tolerance Test (GTT) of the two groups of the experiment at the beginning (left) and the 5th wk of the study (right). Fig.2. The trends of blood glucose level of the two experimental groups during different weeks the study. The counts of pyramidal cells in the selected area of CA1 hippocampal subfield of the two groups were summarized in Table I. There was no significant difference among the pyramidal cell density of the two groups. The results of this study showed no diabetes-induced CA1 pyramidal cell loss in rats 6 to 11 weeks of age. Some of structural abnormalities in the brain of diabetic rodents include synaptic and neuronal degeneration as well as neuron loss (Bestetti & Rossi, 1980, 1982; Garris et al., 1982). Impaired performances in the Morris water maze are characteristic of streptozotocin (STZ)-induced diabetic rats (Biessels et al., 1996, 1998, Gispen & Biessels, 2000) and are associated with impaired long-term potentiation in the hippocampus (Biessels et al., 1996) indicative of pre- and post-synaptic deficits. A point have been observed in some of the mentioned study is that the primary CNS complications of diabetes are related to the duration of diabetes. For example, Type 1 diabetic BB/Wor rat shows a diabetes duration-related loss of CA1 and CA2 hippocampal neurons associated with impaired Morris water maze performances accompanied by duration-related neuronal apoptosis (Li & Sima, 2004; Li et al. ; Sima et al.). Therefore, it seems reasonable that a 28-day period of diabetes in present study is too short to induce a diabetes-induced neuronal loss in CA1 hippocampal subfield. In addition to limited duration of diabetes, the absence of a diabetes-induced neuronal loss can be also explained by the age of experiments of this study. The experiment rats aged 6-7 weeks at induction of diabetes. It has been shown that the nervous system continue to develop throughout such 4-week interval examined in this study (Bannister & Larkman, 1995; Farel, 2003; Juraska & Markham, 2004). Malone et al. specifically confirmed that neuronal cell density have been increased in 4-week rats following a 4-week period of diabetes. They also showed that new small size neurons have been found in the CA1 hippocampal subfield of diabetic animals (Malone et al.). Given these findings, it can be supposed that the possible diabetic-induced pyramidal cell loss can be compensated by a regenerative process within the developing brain of young rats. The results of present study proposed that diabetic-induced CA1 pyramidal cells loss may not be seen in the early stages of diabetes especially in a young developing brain. This study was supported by a research grant provided by the Department of Research, Gorgan University of Medical Sciences. We acknowledge the invaluable contributions made by Dr. Soleimani.